Gather the troops, collect the iPads, turn off Netflix, confiscate the mobile phones and bring on the board game fun. If you love board games like we love board games, then you’ll want to jump on the board game train and give Pay Day – a fun game by the makers of Monopoly – a spin. We have five Pay Day board games to give away. Keep on reading to find out how to enter! Family fun is the best kind of fun. But I’ll be the first to admit that we struggle for ideas, especially after dinner when we want to wind down, relax and prepare the kids for bed. We usually turn to kid-friendly movies which is a nice way to chill out, but also gets a little stale. I mean, there are only so many kid-friendly movies you can watch! Lately I decided to stray from the remote control and introduce games night. You see, my husband and I have always been closet board gamers. I remember playing board games as a kid ALL THE TIME. But the kiddies were still a bit too young for many of my old favourites. Not anymore. Both my boys are now old enough to join in and we’ve been playing a different game every week for a while now. I have found that the kids are actually a lot calmer and more settled for bed after our games night compared to our movie nights. Plus, it breaks up the evening routine and leaves us laughing at each other, not just at Pixar characters. So when the opportunity came to check out Pay Day, a Monopoly-like game for families, we jumped at the chance. 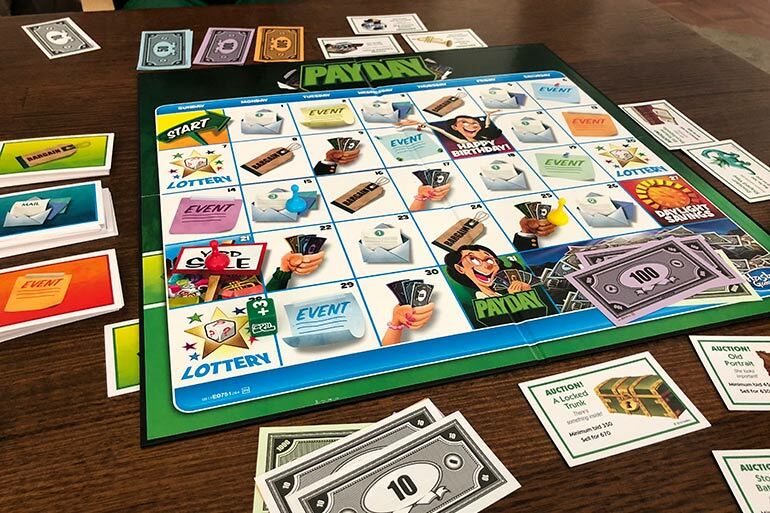 Pay Day is new to the board game realm and well worth adding to your games night rotation. It’s all about money – making money, spending money, saving money. Basically, it’s like a board game about shopping. Oh and saving. But mostly shopping. The object of the game is to try and make it to the end of the month without going broke. Each player needs to hunt for bargains (fun, I know) and then sell these items for a profit. You can take out loans, make deals and do whatever you need to do to stay ahead (except rob the bank, which my nine-year-old tried to do… twice). Whoever has the most cash at the end, wins. The game is suitable for kiddies eight and up but my youngest is seven and he held his own. We managed to get through the game without a single fight or tear and the boys have asked to play it again for the past three board games nights. Which works for me too because I have yet to win a single game and MUST beat my husband at least once. If you love the occasional games night, whether with your family or friends, then give the Pay Day board game a go. It comes with a similar vibe to Monopoly but doesn’t take nearly as long to play. And you don’t go to jail. You can pick up your own Pay Day board game at most major retailers, toy and hobby stores for $39. We’ve got five Pay Day board games to give away to five Mum Central readers. Simply fill out the form below to be in the running to win. Win 1 of 5 Pay Day Board Games from Monopoly! What a great rainy day activity!!! My kids absolutely love the original monopoly. We play as a family and the kids play Everytime they have a sleepover. It would be good to change it up a bit and give this new version a go. We play a family board game every Saturday night and always on the lookout for a new game. We love our family games night! This would be a great addition! My kids LOVE Monopoly Junior and I think they would love this too. Bring on Games Night! The memories it will bring back (this game was at the holiday house we visted annually as children) and it will be great to create more memories of Pay Day with my children. We love a good board game battle. We love playing board games as a family but they are expensive. This is one we haven’t played before and sounds AWESOME…. I love playing board games with the kids, it’s a great way to get away from screens and connect. My son loves board games, money, maths and any competition to bet someone. This was be a great way to get him to teach his brother how to play with him at something he loves. So that they can bond and play together, his brother has Autism and social interaction is challenging. I would love to try this game as my partner, I and our 7yr old love to find new games to try and love nothing more having a lazy board game afternoon. Our kids are getting more interested in board games and in money (mainly spending it) so this would be a brilliant way to connect with them on this topic through play. Because we’ll never be bored with this board game! Boards games are the best family fun! We used to play board games as a family when I was a kid and it was so much fun. This game looks like a great laugh. A good way to spend some valuable time with the kids, making fun memories. Board games are our favourite way to spend time together having fun! Our family loves board games but I think we’re a bit over monopoly. I think we’d all grow to love this new version! Our family really enjoy playing board games together and it gives us a great chance to all spend some quality time together as a family. We love our family games times. And new games are the best! It’s a good way for the 3 of us to stop the busy and reconnect and laugh and learn. I would love to play a new game. We play the same things over and over. It would be good to try something new. This game sounds awesome and right up our alley. The kids have just learnt how to play adult monopoly but we tend to only play it over the school holidays as it’s so long. This shorter but similar concept game would be perfect for weekends or on one of many of our camping adventures. I would love to win this because the whole family loves Monopoly so this new game would be a hot hit with the family. Absolutely love board games and it’s the only time our whole family really comes together is for Mum’s famous Sunday Roast’s.. It brings back such great memories when we all play games after lunch, so it would be fantastic to add another game to the list we can play together.. I could surely make use of this game. My son, as many kids these days, is addicted to video games. It would be a great way to get him away from the video games and tv screen to join in some family fun . I’ve just started playing monopoly junior with my eldest, she’s loving it. Some variety of games would be good. Board games are just a great way to spend family time! The kids unite and generally win! Payday is cash & shopping? Mum is surely now to win! My husband and I host international students and this would be a great way to interact with them while helping them improve their English speaking skills at the same time. My family LOVES board games especially my son. Unfortunately we lost most of our collection a few years ago and are still adding back to it. Board games are a wonderful way to get families together….away from the TV and computers. Board games are fun and entertaining and great for all ages. All the pieces are lost… I need some technological excitement back in my family’s lives. Great fun and interaction with the family, enjoying quality time spent together. Monopoly is a huge hit in our household and sitting down together playing such games is a great way for us all as a family to catch up and spend some quality time together without anyone looking at a screen of some type. We all are game mad and this one looks amazing . Great fun for all of us . A great way to get the family together and get a little zest into the evening, especially when it comes to the matter of money. Such a fun family game that really brings everyone together. Would love to play it again! Mum son bonding time – I used to play this game with my mum as a kid and would love to have a copy for my son and I so we can have some great bonding time whilst teaching him about money. This is hours of fun for the the whole family and it doesn’t involve a screen or eating! My daughter absolutely loves board games and we play at almost every day! Its entertaining and fun! I want to win to freshen it up with a new, fun and exciting game!! I love playing board games with the grandkids. They are away from TV’s and computer games and their faces light up and the excitement is so grand, it is like they are playing for sheep stations. My family and I love getting together with family and friends and having board game nights. I would love to add this one to our collection of board games. I reckon if it is made from the makers of Monopoly than this is the new MUST HAVE board game that families will be playing for years. (Probably passing it down to the next generation) I can see many nights of laughter for all ages. Growing up this game was what my brothers and I used to play by candle light when mum couldn’t pay the electricity bill. I didn’t know they still made it would be a great trip down memory lane. Sounds fun and just might make them think where the money goes! My son loves board games and this will be a fantastic addition to our collection. It’s definitely a great way to put away the electronics for a while and enjoy each others company. Wow payday I remember this as a kid and it was my fav ! I would love to get thisbfir my kids ! I loved board games as a kid, and my children are the same. We would be so excited to give this one a try, and maybe teach them some money skills along the way! We love playing board games – a great way to interact and have a laugh! This game seems to have everything our family would enjoy – a quicker version of Monopoly, which will please the kids; making money, which is Hubby’s favourite pastime and spending money/shopping ….. well, that’s my forte!! My sister and I used to play it all the time but we don’t have a copy of the game anymore. Would love to win this and have a game again with my sis! We love our boardgames, especially games like this. Would love to win one! We have a regular family games night with ALL my sibling kids and the grand parents. They love it despite themselves. This game none of us have and I’d love to share the monopoly legacy with all the kids. It was my first board game. The best quality family night would consist of staying in with good tunes and plenty of board games. Please add Pay Day to our collection. Would love to play this with my family. It would be so much fun to have them all together. I will make some snack and tell hubby to buy soda and pizza..perfect nite! There’s usually 8 of us, who doesn’t love a family games night?! What a fantastic game for the family. Get everyone off social media & have time in the real world together. More board games to balance out the excessive video games is a winner! Be a great way to teach the kids about money and we all love to shop, so this sounds like fun and well as educational. Bedtime will become later and later with this boardgame in the house, haha. In our house we have some very big monopoly fans! We have a big collection, would love to add this one to our collection!! With 4 kids we are always busy. Games night is a way we can stay connected as a family. We love our games night. My son always wants to play Monopoly. This one looks pretty awesome. We would definitely need to have a games night with friends if we win. I play Monopoly with my 5 and 8 year olds. It has done wonders for their maths. I would love to try this new game with them. Our family loves board games. We like trying new board games. My two little boys have just started taking an interest in board games. It has been a great help for them educationally and it’s such a fun way to spend time together as a family! Monopoly was a favourite game of mine growing up and I’d love to make the same memories with my boys. 2. as a young chap with learning difficulties in reading & spelling, the opportunity for family games night to be a ‘learn while you earn’ experience is too good to pass up. 3. 7 1/2 is clearly the new 15, so our beautiful lad believes that he is too old for ‘junior’ Monopoly anymore! We would love to win a Pay Day board game, as it would not only be fun to play, but it would be something new to play! Board games really do bring all of the family together and PAY DAY does sound like a lot of fun. Our family love Monopoly so I’m sure would be one a favourite on game night! Board games are a great way to learn a range of skills while also having fun. With two teenagers just starting out with part-time jobs this is great way to teach them the value of money. Loved Monopoly as a child, would love to share this with my own kids! My twins just turned 4 and they always complain they are bored. So we could start a new tradition of family board game night which I’m sure they’ll love. Pay day used to be one of my favourite boardgames. Would love to introduce it to my son..
Because it would be a fab change from Monopoly (which, let’s face it, can be a little long-winded!). After playing The Game of Life my children have a new found love for board games and keep pointing this out in the shop! My son is a crazy Monopoly fan and we have played it over and over again. So it would be fantastic to have a new fun family game to try. Moving house and Grandma will be looking after the kids. This looks like a lot of fun for them. We’re lucky enough to have kids who love playing board games, and we’re always on the lookout for new games to play. This one looks awesome , and might even help them learn a little bit about budgeting along the way. Win/win! Another great version of Monopoly to reduce screen time and increase family time – love it! We are a pretty competitive type of family, me and my 4 boys (including hubby) as the only Lass I need to win these things! Game night will be onnnn with games like these!! Awesome night in to spend with the kids! I’d love to win as Friday is our games night but our oldest is getting a little tired of our games and needs something new! My granddaughters love monopoly so it would be wonderful for them to have a modern version of this game to play. All children should learn new board games and all the learning that is involved in doing so. we had many great times as kids with board games, and especially ones Luke monopoly. I’d love to be able to start that up again! Omg blast from the past! I LOVED payday!!! Every sleepover today was brought out to play!! I would love to be able to share that with my kids! Who doesn’t like a game og Monopoly! WOW!!! 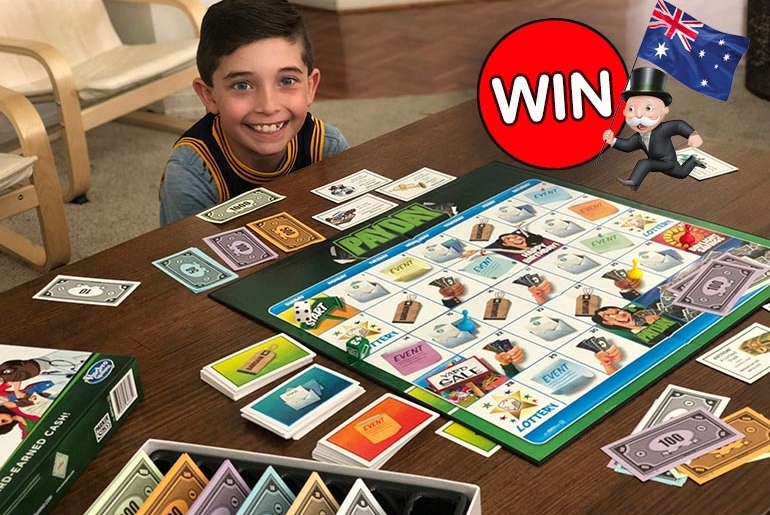 I would love to win monopoly payday as it sounds like FUN and TEACHES both child and adult about spending your money wisely!!! Board games are a great thing for a family to play and also anything to get my girls off their devices would be awesome.. I have some great memories of playing board games with my family on camping trips, plus we have just bought a camper trailer so wold be great to be able to take these with us on our adventures. Would love to try a new game! My oldest lil man is now starting to understand how to play boardgames and sitting still long enough to do so. This game would be a great addition to our still young game collection and gift for someones 8th birthday. Best night growing up was board game night with the family. Would love to have this with my own kids & what better way to start than with an exciting new game. Family fun doesn’t get any better than board games! I remember playing ‘Payday’ as a child. Unfortunately it was so well loved it fell apart! I’d love to play this fun game and make memories with my kids now… and reintroduce it to my parents. Board games are what brings our family together. And then…….we fight. Our family lov board games and we would live to try this new game! Our family loves game night, and a new twist to monopoly sounds great. Our family loves games night. I’d love to play something different for a change. We love to win please. My whole family are big monopoly fans, we have at least 3 versions including the original game from my mum’s family from the 60’s, and the Disney and Pixar versions. We would love to try this new game, it sounds great! My family is always busy but loves playing board games, so winning this will give us all a chance to sit down and have some fun! I need this game to keep my kids off iPad and tv and have some real fun . I grew up in India so our games were different, would love to play it . My Mum used to have this game many many years ago and we were just talking about it a few months ago. I’d love to win this game and teach my kids how to play, just like my Nan taught my Mum how to play games. Board games are awesome family fun. I’d love to win the Pay Day Board Game as it looks like a fun addition to our collection for games night. Was going to buy this a week ago, but thought I’d hold off till it went on sale! The kids are Monopoly CRAZY !!! my grandkids absolutely love monopoly so this game would be a new challenge to them all, yes please. We have both loved growing up playing board games and making lots of memories. We would love to keep that tradition with our children with this board game and hopefully teach them that there is so much more fun other than social media! I am worried about the amount of time children spend glued to “smart” phones, ipads, and streaming media content. Hopefully more games like this will tear them away from their virtual reality and back into the real world of social interaction. I love board games! And this would be a brilliant learning game with the kids as well as fun! Thank you for the awesome chance to win! This game looks amazing. We are always on the lookout for new games and have more family time. I love sitting down with the grandkids and playing board games. It’s better than them being on their iPads all the time ! I Homeschool my 3 ASD boy’s and this would be perfect with helping them to learn about money and how to use/spend it. They love to learn in a fun educational eay and we all love to play games together. We’re a family of game board LOVERS – as the primary, and yet currently unemployed, earner in our family I’d love to shout Payday if we win this.. everyone would laugh with tremendous ironic mirth. Our son is coming to the age where we can start teaching him board games – so this would be his first game! I love the traditional board games over video games, and fun for the whole family! We love board games- educational, fun and problem solving! Love to win so my family can play payday to learn that money doesnt grow on trees and only stetch so far each payday!! This is a creative way to get the kids off electronics and have some family time. Every single time my family have a BBQ or any type of get together, there are always games brought out….I’d love to win these to play. Our daughter’s at the age to start playing board games and this looks like a really interesting one! We would love to see all that cash around us, even if it isn’t real. Hopefully the game will motivate the kids to riches. We would love to introduce some traditional games to our kids who are ready to play. We would make a family night of games a regular thing to do every week. Monopoly will always be a classic in this house and would love to branch out and try something new. This one looks great and heaps of fun. I wish my kids would know more about money by playing such fun game. 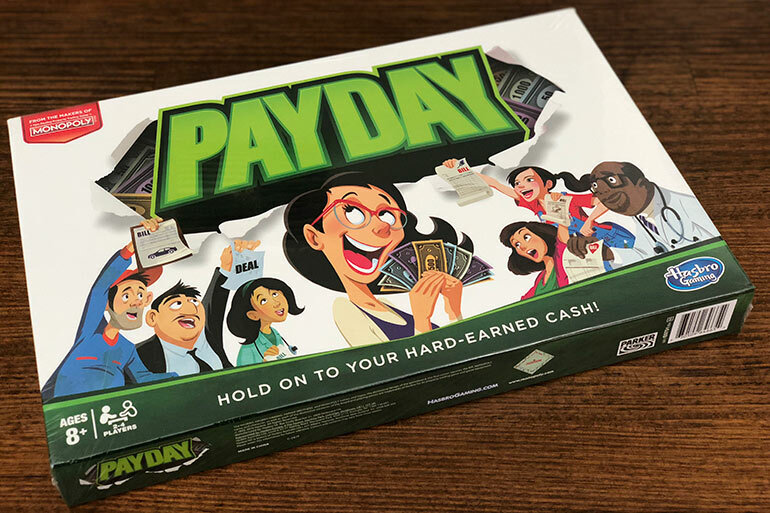 Payday seems like a fabulous addition to our board game collection! My children (particularly the 7yo) don’t understand the value of money – partly due to the prevalence of paying with a debit card rather than actual cash – so this would be a great teaching tool. It’s been so long since I had a real Pay Day of my own that I think I’m going to find earning fake dough and hunting for pretend bargains even more exciting than my kids will! This game would be great to play and enjoy with the entire family whilst learning and making financial decisions at the same time. Looks like a great game to get the family together and the brains ticking! I love to win because it appeals to young and old, and encourages creativity. It would provides years of use – even being passed down from generation to generation. It’s also educational, accessible to everyone and brings the family together providing pleasurable memories for years to come. Cozing nearby the fireplace would be perfect with the kids. At the same time this game is educational which is all we ever want and love! I’d love to win Pay Day, our family and friends regularly enjoy a board games night. It’s always such a laugh! Pay Day Monopoly would be educational but fun. Helping the kids learn to save is lesson number 1. Our game nights differ each week we play. This board game is one that we can enjoy anytime of the day. I grew up playing monopoly the smell of the printed money , the feel of the little pieces that represent a different world and the long long long game times needed to play which would immerse you in that world. It also teaches you some valuable financing tips! I cant wait for my children to experience such a cool game !!! I remember playing payday when I was a kid,would love to play it with my two boys! My son and partnee love to play board games together! Educational fun at its best! Maths, life skills and fun bundled into a board game…. it doesn’t get better than this! And get them early right from the start! Family loves playing board games together, this looks fun. Family Game nights are always fun but not always argument free. Would love to match up against the clan with Payday! I know all too well of the anti social behaviours iPads and technology have caused, having more board games around the house would keep the kids occupied and prevent their square eyes! Something we can play together and all reconnect as a family. We love playing games as a family, especially as they help our kids learn valuable skills like counting, how to react when winning or losing and how to be a good sport. We would love to add this to our collection! The kids are just getting to the age they can enjoy board games and I can’t wait to beat them. I want my kids to know that enterment and laughs aren’t just found on the screen. It’s found through some healthy tech free competition! My boys love board games with their cousins. It teaches the kids how to save…and reminds me how to do it, too, haha! Love board games, a new one would be brilliant! My son loves playing board games, but he’s getting a bit bored (pun intended ) of all the ones we have at home. This game looks great and would love to give it a go! It looks like a great interactive game for all ages to have some fun with! Great way to get kids off technology and back into the fun of board games! I love this! We would love to play this on family games night to see who will be the WEALTHIESTand who will be BROKE. Living in a cashless society the kids can see their starting balance, pay utilities and then learn to spend wisely and have fun along the way. As long as my older brother doesn’t play, I remember as a kid playing monopoly & if He ever lost he would flip the board over and walk out ! We’ve got pretty sharp limits on screen time during the week; I’d absolutely love to be able to introduce a regularly family games night to help us maintain that. The whole family nan pop Uncles and Aunts love playing board games with Lily aged 6 . Always fun and always welcome new games to play . I used to play Payday back in the day. I’ve never seen it in shops but always wanted to play it again. I need to win so I can take on my sister and brother again. I have fond memories of playing board games as a child and my favourite was always Monopoly. Now as a Mum of four I love to play board games with my kids. It’s a great way to spend some quality time together and its a lot of fun! A game that makes learning fun? Yes please! I have some great memories playing board games with my family as a kid growing up. I would love to win so i can take with me to our christmas in july catch up. First time we have all been together in 15 years so would be great to re-create our childhood fun, and share our memories with our grand kids, nieces and nephews. Our family had a tradition of having a game night every Friday night. TV and mobile phones are turned off, quiet music is put on at the background, old fashion board games are pulled out of the cupboard. We absolutely love our Friday nights. Monopoly Pay Day Board Game would be a wonderful addition to our well used Backgammon, Original Monopoly, Cards, Trouble and more. Did someone say GAMES NIGHT!!!!!!!! Woohoo. Would love to play this with my family! It’s family board game night, bring on the Pay Day! Both adults and children acquire great enjoyment with board games which can also be played with visitors. They encourage interaction with others and some are also educational to some extent. Monopoly should also teach both adults and children the value of money, that you have to save before you can spend it. I would love to add this to our collection of family games, we love Monopoly and this sounds similar but with the benefit of not taking so long to finish! Because my family currently has a Monopoly on my Payday! Teaching money skills is important and pay day would help reinforce those skills. Our Family has always played games together, I’d love to have a game we could play with our grandchild Noah. Family night is always a board game (normally monopoly gamer), a big cheese board, which my five year old refers to as a “cheese party” and then a movie. We have had this routine now every fortnight for the past two years. A new board game is always met with a great deal of enthusiasm. I love testing my patience and other’s temper and monopoly has always proven to do this. I want to see if this game will make or break my family. Would love to win this prize. My 8yo son is really getting into board games so we now have special weekly “family game nights”. We try to have monthly game nights with family and friends. Even the younger ones are encouraged to play, especially UNO. We love GAMES! Because I cannot take one more game of uno or mastermind – time for something new!! 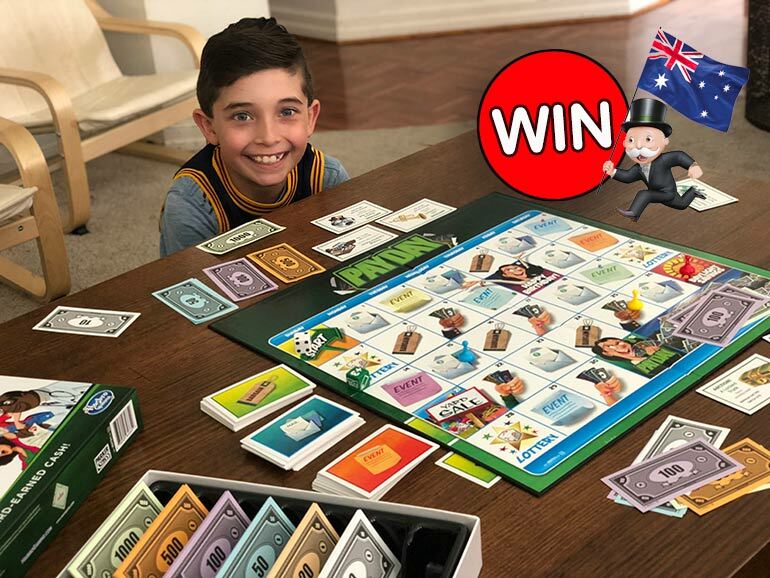 Monopoly’s Pay Day board game would give us heaps of quality family time and get the kids away from the screens. Monopoly is our favourite family board game! Would love this addition! Payday for me is once a month. Now we can enjoy it everyday! It would be a fun way to spend time. Monopoly has been a favourite since my grandmothers day, we are at present playing the Adelaide Edition and would love to try a new one. It makes a lovely change to turn off the T.V. and chat and laugh playing Monopoly,scrabble ect.Would enjoy this new game! I love the familiarity but also the difference with this great game, would love the chance to play with my people! I’d love it because it would make a nice difference from us all staring at a screen. In a new relationship with my partner and getting to know his 2 amazing kids. Board games are a great way to break down barriers and just have fun. I would like to play an educational game with our grandkids when they come for a visit. I don’t think it’s a good idea when kids only play games on their tablet or smartphone. Monopoly brings on the fun everytime, and the family that has fun together, continues to laugh together! We have family game night every saturday we would love to add pay day to our fun family nights. Every Friday night is games night for us so I’d love to introduce a new game for my family, we all love Monopoly so this is bound to be a new favourite. We’d love to win for the interaction board games give. Our family has 10 different versions of Monopoly. Clearly we love the game! My kids love board games and would love to add this to our stash. Because my kids and I love Monopoly, and we will love this game as well!! Would love to have these games for family get togethers. My kids LOVE Monopoly, the new Pay Day game would simply make their day!!! We have game night once a week a new game would be great for our little collection we now have. We love family game night here and our lil guy (5) is learning about money so Payday would be a wonderful addition to our games!!! Would be a lovely weekend game. I have always loved family board game nights. Adding to our collection would be a great excuse to recommence them! My great-grandson loves Maths and I’m sure he would get great enjoyment out of playing this game. You had me at “put down the iPads”. Would love this game for my family. family time, bonding time, turn taking, co operation , learning fair play…..
We love to bond over board games together a s a family. Brings back so many memories from when i was a child. Use to be my all time favourite game though i did not know they still produced the Game. Would love my 2 kids (8,16) to experience the fun and pain i had, playing this awesome board game. Quality time over a games and family night can’t be had without a challenging and laughable game of Monopoly! Anything I can contribute to our games collection that isn’t D&D is a win in my books!!! We love board games in our family! I’d love to add PayDay to our collection! My sister and I used to play the original Payday ad nauseum, and after I left home I found a copy for $2 in an op shop. My son and I played it to death! We would love a new copy! Cant beat a new game to add to family games night. Pay Day was a game I played as a kid. Would love to be able to share that with the kids in the future. I have wanted to collect different board games and what better way to do so than with this beauty of a board game. 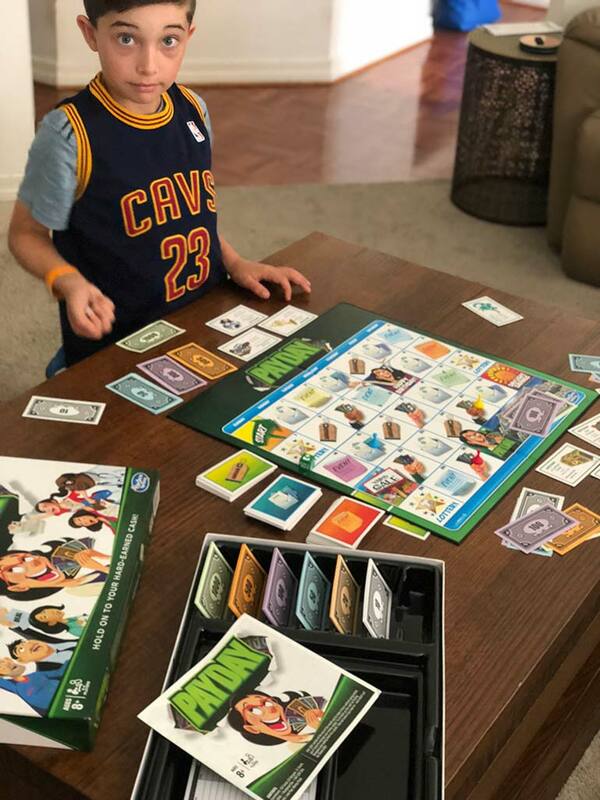 A great game to teach the kids that money is hard earned In a fun interactive way the whole family can enjoy! Great for a family fun night with some sneaky maths! My partner and I love to play our board games. It gives us lots of laughs and a great way to have fun, without having the tv on. As a rule in our house you have to earn your electronic/screen time and a good way is to participate in our twice weekly board game nights! We need some new fun like this! Payday look like a game that my family would enjoy, My children would love the challenges that Payday would give them. Payday seems as the type of game that would help promote the family time. I must continue ruling my Monopoly Empire in all forms of the game. Watch out kids, its Payday and Mummy’s coming for you!! Again!! We love playing The Game of Life and Pay Day seems to be a fun extension of our favourite game. Would love to add this to our collection for game night. Boardgames are something that my family have missed out on so far but something I would really like to introduce on a regular basis. We have such fun when the grand children come over and we play all the old board games that date back to their parents youth. To bring the whole family back together again for a great games night. Time for family bonding! Great addition to our family board game nights. A great “excuse” to ban tech and the tv for an evening! I just love it when we are all involved in a family activity, no devices or other media distractions – just us, laughing and relating to each other. This is amazing for the whole family full of fun, and at least the brains are working while we enjoy ourselves. This would be so good for us and our friends, I just love monopoly we all love it and it brings back our wonderful childhood memories when we used to fight over it all the time, but we are older now.,I think. I loved playing this game as a kid, it was my favourite and I would love to play it with my son. We love playing board games as a family and Monopoly is one of our favourites. The Pay Day board game looks like it would be even better for our traditional family board game nights! We regularly play the Dr Who version of Monoploy as we don’t have an original version, but would love a new money based board game. We have a tech free rule on Friday night where TV, mobile phones, gaming devices and computers are all switched off for 2 hours and we bond as a family. Would love a larger variety of games in the house to keep everyone interested! A different game to try out with the kids sounds great! Yay family game night! Bonding time and family laughs. My family has always loved a family game night since i was a kid, i wanna start that tradition again with my own kids now they are old enough. My wife and I regularly play boardgames with friends and family. We are always on the lookout for something new. Oh wow! I can’t believe this game is out. I had this game as a child. What an awesome game to play with my son. I live shopping and I love board games! Match made in heaven! My boys both love board games too so we’d love to give this one a try! My parents had the original version of this and used to love playing it! Haven’t seen it in shops so didn’t think it was still around. Would love to win one to play with my family. We are avid boardgamers in my family. We have friends over for monthly boardgame days, where we break into teams and do a round robin of games, complete with epic overall scoresheet and a prize ceremony. This would be a great addition to our shelves! Winner – Good old fashioned fun, special time with kids and no electronics in sight! Will make a nice upgrade from snakes and ladders! Pay Day sounds interesting. Would love to trial it and see if it mayfair well or will it go directly to jail and not pass go? Trouble is getting a little tiresome….. and the original Monopoly I was banned from pre-kids (have you seen that Monopoly meme???)…. this seems like the perfect games night game! Growing up, family game nights were a key part in family time and our childhoods. It brought out the competition, as well as created amazing memories that we still reflect to on this day. I’d love to have the same memories created for my family, enjoying our company and having a little bit of friendly competition! Our grandchildren love playing board games when they visit (we have 10.5 grandies). The older kids can learn to play it and teach the younger ones . We have family game nights here at home..
We had a game similar and my dad gave it away 🙁 I would love to play this with my kids. With this game there is so much to learn. Love family board game days, and this one sounds educational too. how great it would be to build on that. A family game night would be absolutely perfect! This would be a lovely addition to our family game nights. A magically heart-warming, joyful ‘Thanks Mum Central’ everyone would say! Love board game nights with the kids, some of our funniest moments are when we come together with no devices to play a game. There are a few that we keep rotating between so it would be nice to throw a fresh new game into the mix, looks like fun! I played this as a child and would love to play it again with the grandchildren. Fun and educational – the ultimate board game! Bringing families together for decades. This will make family game night even funner! Payday would be a great start to this new tradition…Thank you. Up for a new board game challenge. My late mother and I used to play so many board games when I was growing up and PayDay was one of my favourites (Mum’s too because it didn’t take as long as Monopoly!) My daughters and I love playing board games too and I’d love to introduce them to PayDay! And it doesn’t make a budget dent! A board game that doesnt take 3 hours to play looks just perfect for us! Board games bring the family together even if there are little squabbles! Any excuse to have a family games night! I’d love this to teach my Nephew money and saving skills. I am looking for new ways to educate my three children about budgeting, saving and investing. Payday looks perfect! My daughters would love Payday, and I would love them to understand the value of money before their teenage years!! What a fun game! What a fun way to get the money saving and spending lessons on the go my family and friends. Monopoly was my favourite game when I was a child. The benefit of Monopoly is endless, kids learn counting, making and investing money. This is perfect for games night for family fun together.